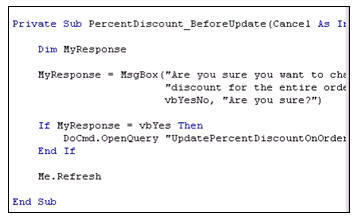 Access 305 continues our advanced Access database development with VBA programming. We continue work on our sales and order-entry system. This lesson focuses on building an Aged Accounts Receivable. You will learn a lot of new tricks including using a MsgBox to ask questions, the vbYesNoCancel option, the BeforeUpdate event, and much more. 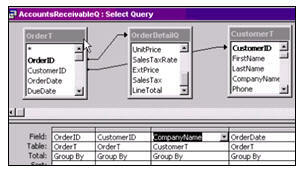 We will begin by creating a query to hold our Accounts Receivable data. You will learn how to determine how old certain invoices are - which are current, which are 30-days late, 60-days, etc. Then we'll create a Report to display our AR information. We'll create form headers and footers to sum up the data. Next we'll learn how to give each order a Percent Discount. We'll give each item on the invoice a possible discount as well (in case certain items are, for example, 50% off). I have purchased and gone over Access 305 with respect to Accounts Receivable. but I am having trouble using the IIF function to count the aging of balances. I get an error. Please help. Richard Rost on 3/23/2009: Bill, I would need to know much more than this to help you - for starters, what is the specific error message you're getting? I want to use the IIF to use the Invoice Date from the Billing Private Table to determine the aging of balances. I don't know where to go from here-Please help. I enjoy learning from your lessons. I have created my Accounts Receivable Report and there is one item that I need for collections that I can't get the data into the report. Customer Telephone number. This is nested in another table called Patient Data Table but the AccountsReceivableAgingQ does not have the patient telephone#. How do I bring another table into the current report so I can I the Telephone as a field list item to choose. Richard Rost on 3/24/2009: Either add the appropriate table to the query, or create another query based on the two and link it in. You can't bring another table into the REPORT, but you can bring it into the underlying query. I was surprised that you did not use VBA code for the Aging Receivables. Can this be done? Ayman, I almost NEVER use filters. I prefer Where conditions. Perhaps I'll try to cover them in more depth in a future lesson. That shouldn't happen. Date() is a built-in function. Make sure you don't have any FIELDS in your table named Date. Jim Gray on 3/24/2011: Here is a curious one for you... I am using Access 2010 and wrote the code to hide the zero values in the format section but, for some reason the zeros do not go away. The code is very basic and I don't get any errors after I type it. Any ideas? Thanks. I haven't tried it yet in 2010. Ill add it to my notes to look at when I update the class. Can't seem to work out which code needs amending. Sometimes that makes a difference. Alex Hedley on 3/31/2011: In the PercentDiscount_BeforeUpdate event I've added some extra code so that when the user clicks Cancel the Discount Rate is returned to the original value. I did this because if you make a change to the Percent Discount but then change your mind and press Cancel you must then make a change before you can continue. It won't let you move to another field. The Cancel = 1 simply stops the cursor leaving the control. I was just working through Acts Rcvbl 2 in Access 2010 and had the same problem that Jim Gray reported about the "Current" text box property of visible not being set to false when it's value is zero. I fought with this for quite a while before realizing that in 2010 the default view when running a report is Reort View and the "On Format" event only fires for Print and Print Preview. So after switching to print preview for the report I found the hiding of the textbox value had been working all along. I know that it has been some time since this lesson was recorded and that the solution has probably already been mentioned but I thought that I would post it just in case someone else like me was pulling out their hair. I do have yet to run through this example with Access 2010, but thank you very much for the notes. 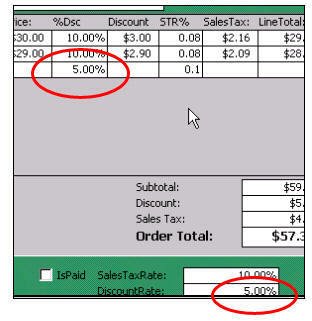 Kevin O'Malley on 6/21/2011: Hi Richard, in Lesson 305 4. at 6:38 you show "PercentDiscount" in the action query and then you add a coupon to the order then return to the query design but Percent Discount is now missing. It then seems like you start the lesson over. It seems a little disjointed. Did I miss something? Kevin O'Malley on 6/21/2011: Richard, (lesson 305.5) in Access 2007, after I change the percent discount, I get the vbYesNoCancel msg box. If I say yes, I then get another mesg box that says 'you are about to update three records. do you want to continue?' If I say no, I get an error. How do I get rid of the second message box? Discounted Price of 40.5 + SalesTax = $44.04? You're right. I fix the problem in a little bit. Keep watching. I can tell you that if you type in the expressions EXACTLY as they're shown in the video, they will work just fine with Access 2007. I've tested this with 2003, 2007, and 2010. I can see from your copy/paste that you did type in LessThan30 and LessThan60 wrong. You've got just = in there and not <=. Although that wouldn't generate an error as it's written, it's incorrect, so it leads me to suspect you've got something else typed in wrong too. Not sure if your language has anything to do with it. I've never used any of the foreign-language versions of Access, but I doubt that's the problem. Sandra Bischler on 12/12/2012: I figured it out. I do not know if it has anything to do with the french version, or not, but I changed the comma (,) with a semi colon (;)and now it is working!!! Yes, that definitely sounds like a language-specific version problem. I've NEVER used a semicolon in that situation. Clay Fulgham on 3/23/2015: Same problem happened to me as Jim Gray. For some reason, the code didn't work as basic as it is, no errors, and the zero's are still being displayed. I tried for about 30 mins to fix it, but decided to move on. Great Lessons!! Have you seen Mark Clark's response about the default view that is shown? CHARLES FULGHAM on 3/29/2015: Mr. Hedley, just now following up on my comment. Didn't see Clark's response however, for some reason, during Developer:310 as we revisited the Acts Rcvble Report, upon open, now all the zero's are now NOT being displayed. I'm sure one of these days at some random point (like while grocery shopping) I'll have an A'Ha Moment! Thanks for the follow up. CHARLES FULGHAM on 3/29/2015: Okay, figured out the issue. I was opening the Acts Rcvbl Report by double clicking it from the All Objects, which opens it up into "Report View" with zero's displayed, open switching over to "Print Preview", zero's not displayed. The Force was telling me all along it was something simple. Thanks for everything. Loving these courses! vicki Hudson on 10/30/2015: at 11:00 we start setting msgbox for "Are you Sure?" I am automatically getting asked yes/No/Help "You are about to run update query that will modify data in your table." then again "You are about to update x rows". Did I miss a step to make these messages not appear? Should I follow the help instructions to "clear action queries check box"? Emad on 2/16/2016: Hello, If I change the Tax for example 5% and I click on Cancel or No, the Default value changed to 5%, the Default value should be old value, how can I do it? I'm not able to replicate having the message box display the old value for the discount rate. At approximately 4:30 into the video, Richard inserts percentdiscount.oldvalue into the code. When I try this, the message box displays the new value that I am changing to. Any idea why this might be happening? You need the SQL statement that would show a message between those two statements since you are say, turn off warnings, run code, turn back on warnings, these are system wide so if you turn them off and forget to turn them back on you will never get any more warnings.